The Giants are not a regular season team. They'll squeak into the playoffs and proceed to then destroy everyone like Godzilla blasts Tokyo. So why not lose to the Browns? Also the Transitive Property of NFL Mathematics dictates, since a) the Eagles beat the Giants by 2; b) the Eagles beat Browns by 1; therefore c) the Browns will beat the Giants by 1. That f*#$ing punt return...grumble, grumble... Should have beat them in week 2; will beat them in week 6 at home.Plus, Haden returns in beast mode--someone's getting decapitated. A young team with a rookie QB and an under-performing offensive line? What a joke! Coming off their bye week, San Diego will be over-rested and over-confident. 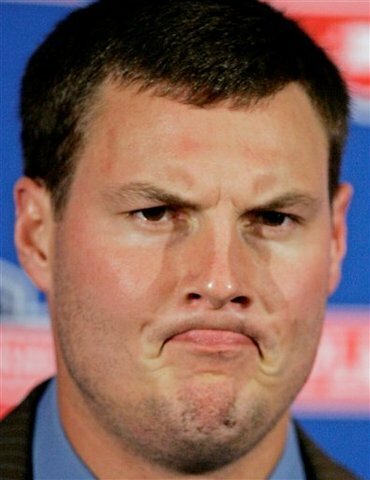 And Phillip Rivers is such a crybaby, I can't imagine him ever winning another game of anything ever. Browns spend this week to playing Madden '13 to pad their stats and eff up ESPN's ridiculous Madden Simulation segments. Although the previously used Transitive Law of NFL Mathematics makes for a grim outlook, you're forgetting to factor in the Romo Quotient (1/4 INT*Celebrity Starlet^2). After two road losses to Atlanta and Philly, "America's Team" (barf) lays an egg at home. Let's look at the facts: Ben Roethisberger has no frontal lobe in his brain. And with his Samson-esque hair cut by a mysterious blogger on Saturday night, Troy Polamalu melts into a gelatinous mass of nothing. Home crowd helps the Browns to their first win against the Steelers since 2009. Honestly, is the AFC West even real football? I'm pretty sure they're playing by Aussie Rules over there. Oakland has a real shot to land the #1 Overall Draft Pick in 2013; doubt they'd screw that up by winning here. Let me ask you this: how many games has Romeo Crennel won as a head coach in Cleveland? Not a lot. Brady Quinn as starting QB and Peyton Hillis out of action with a sprained Labia minora...easy win here. We hit RGIII so hard, he'll end the game RGII. Discovered during their bye week, the Browns utilize a glitch buried in Peyton Manning's source code: by asking him to beat himself at a game of tic-tac-toe, he discovers the only way to win is to not play in the first place. Browns win easy. HEY WHAT'S THAT OVER THERE! SO THERE YOU HAVE IT. Despite an abysmal start, the Browns path to 12-4 is laid out clear as day. Bring on the Playoffs, baby! Well, because...you know... They're the Browns. ‡ It should be said that if one is a life-long Browns fan, perhaps sanity is questionable.